The ‘win bet’ is the simplest wager to understand. In the context of the Grand National you’re betting that a horse comes home in first place, if he doesn’t – your stake is lost. However, should your horse cross the finishing line first you’ll get paid out at the quoted price. The amount you get back from the bookmaker depends on the odds. It’s not often you will find a horse lower than 6/1 in the Grand National, mainly due to the unpredictable nature of the race. If you back a 6/1 shot ‘on the nose’ (win only bet) and he wins, you’ll get back £70 from the bookies (£[email protected]/1=£60+£10Stake = £70). A 6/1 shot in the Grand National is more than likely to be a pre-race favourite. If you take look a look at all the runners you’ll see odds ranging from 6/1 all the way up to 250/1. Back a horse at 50/1 and your potential winnings would look like this (£[email protected]/1=£500+£10Stake = £510). In theory runners quoted with bigger odds have less chance of winning. Nevertheless, over the 168 year history of the Aintree Grand National five horses have returned victorious at 100/1, most recently Mon Mome in 2009. Placing a win bet is simple, two examples are shown below. You can either place the bet online or fill out a slip in your local high street bookmakers. The image above shows you how to correctly fill a betting slip from a traditional bookmakers. You must clearly write the stake amount plus ‘to win’ followed by your selection (horse name) and the time and meeting of the race. 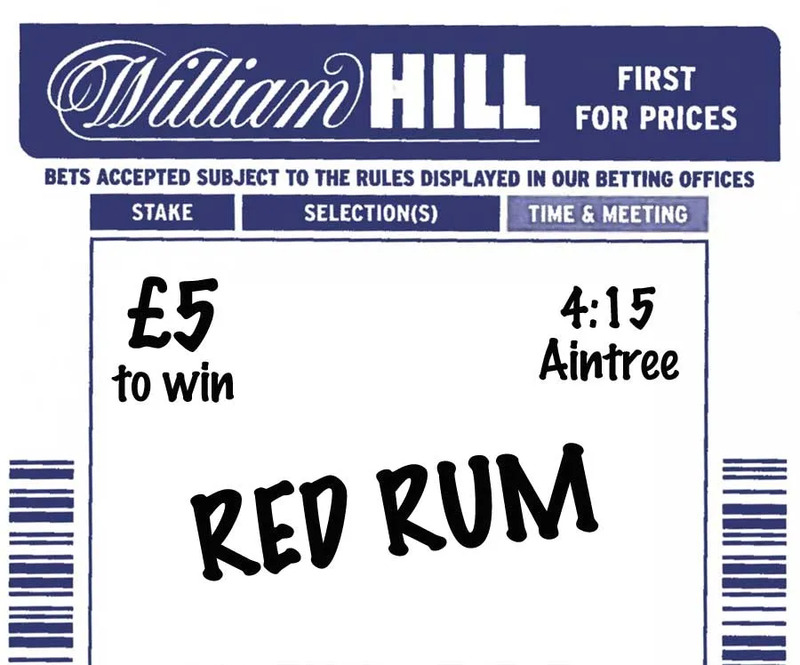 On Grand National day you might find that some bookmakers also have specially prepared slips which only require you to tick a couple of boxes. 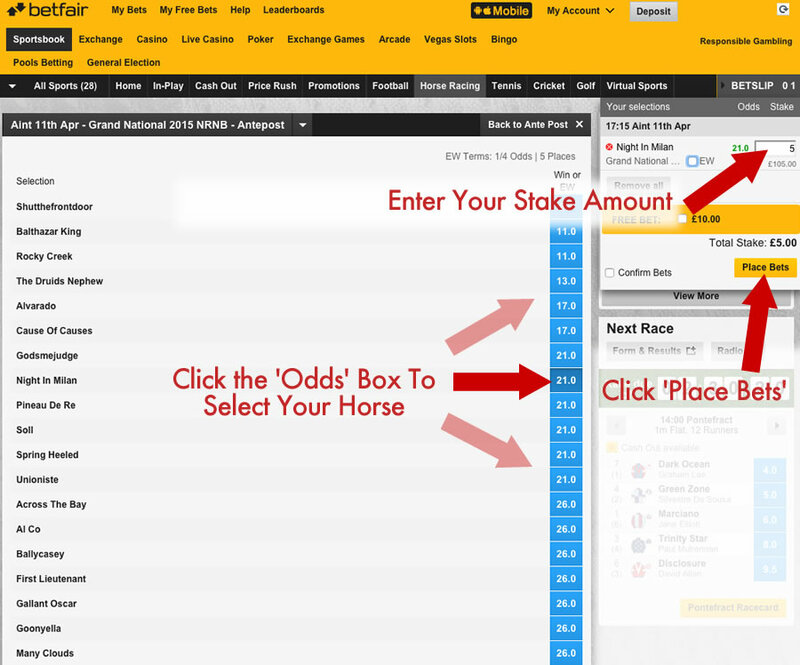 The image above shows you how to correctly fill a virtual betting slip from online bookmaker Betfair. Just navigate to the ‘Grand National’ page, click on the odds box of the horse you want to back, a virtual slip will appear with your horses name and odds, all you need to do then is enter the stake and click the ‘Place Bets’ button.